Ever wondered how long it takes to fly from Singapore to South America? It took me about 36 hours, with stopovers in London and Miami. Thank goodness for in-flight entertainment! On Miami – if the airport is anything to go by, it seems that almost everyone in Miami can speak Spanish (and English). I’ve never come across this level of bilingualism in any other US city! Landing in Quito was a bit of an adventure in itself. There was a lot of turbulence and while people were generally cool at first (the Ecuadorean guy sitting next to me said it’s normal to have a bit of turbulence), after the 5th or 6th dip some people started screaming. I heard from my host family here that the winds later became so strong that a plane couldn’t even land and had to be diverted to Guayaquil. Quito ranges from 2,5oo – 2,850m above sea level – that’s higher than Doi Inthanon (which I climbed in March), the highest mountain in Thailand! I’m really thankful that I haven’t got altitude sickness (so far at least). The high altitude just manifests itself in breathlessness when I climb stairs or ascend slopes, although I’m sure that’s at least partly attributable to lack of exercise as well. the teachers at Yanapuma Spanish School where I’m currently taking intensive classes, etc. In terms of safety, it feels alright so far. I’m taking basic precautions like never taking out my phone or map on the street, and I made it a point to get back before dark (which ironically is how I ended up with that taxi driver – I’d have preferred to walk but it would have taken too long). The most trouble I’ve had so far was finding a local SIM card. I bought one from a vending machine at the airport for $7+, but it turns out that you need a local Ecuadorean ID to activate it. I popped by a phone shop near the school and asked if they sold SIM cards for tourists and they said no. I’d read about this SIM card for tourists that was introduced fairly recently by CNT, but I had no idea where to find it! I was close to giving up, but decided to stop by the Quito Tourism centre (always a useful place!) and see if they could help. As it turned out, they actually sell the SIM card (for $28.50, but it’s better than nothing) and the guy helped to install and activate it, so it was really hassle-free. 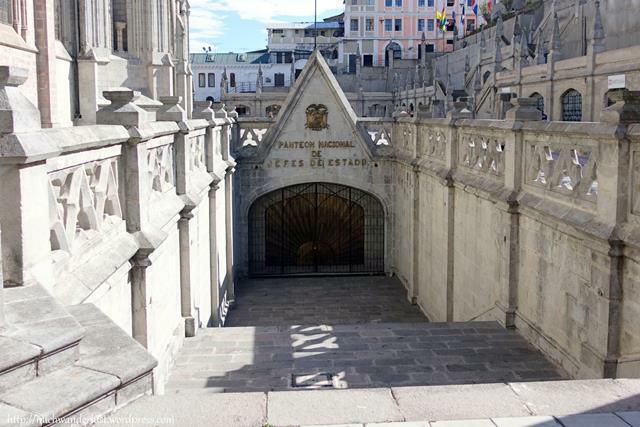 For anyone heading to Quito, the Quito Tourism centre is at the side of the Plaza Grande in the Centro Historico. They also provide free and really detailed maps! 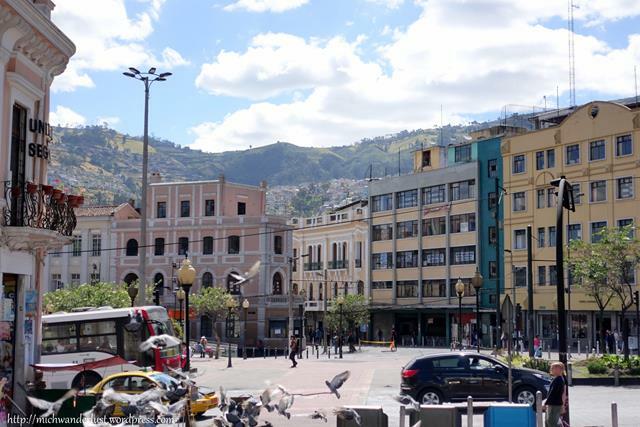 I’ve signed up for the Quito Cultural Program with Yanapuma, which means 4 hours of private lessons a day plus 4 excursions (or cultural activities). 9am – 1pm: lessons, with a 20 minute break halfway. 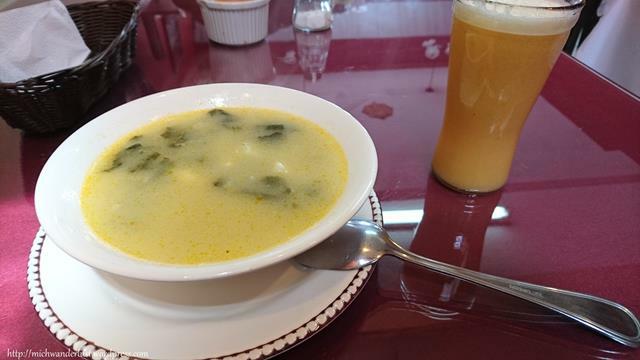 As I’d just learnt during the lesson in the morning, this is a very typical Ecuadorean lunch (almuerzo): cold juice, hot soup and a rice/beans dish. I didn’t get to choose the juice and soup, but I could choose between carne and chuleta for the main dish. 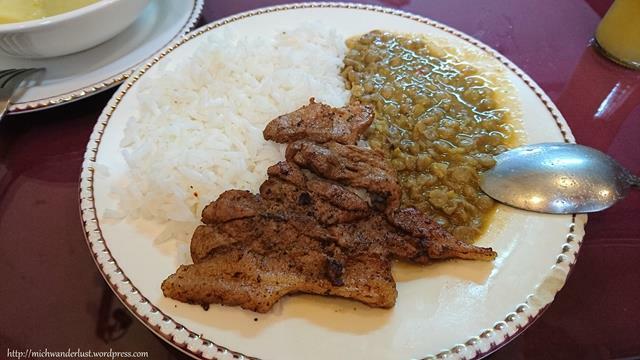 I went for chuleta (pork chop) which was a bit salty, but I wasn’t that hungry anyway. One of the keys to dealing with altitude sickness is to eat light meals! All this for just $2.75! 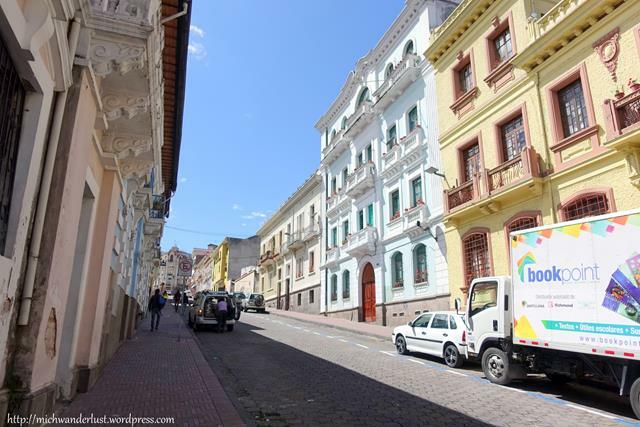 2pm – 5pm: Walking tour of the northern part of the Centro Historico. First stop: the San Blas neighbourhood. This church was the first church built for indigenous people. In colonial times, indigenous people weren’t allowed into Spanish churches (only Spanish people and (most the time) those of mixed Spanish and indigenous heritage were allowed). This monument just next to the church of San Blas marks the place where Jumandi (one of the indigenous rebels during the colonial era) was murdered. 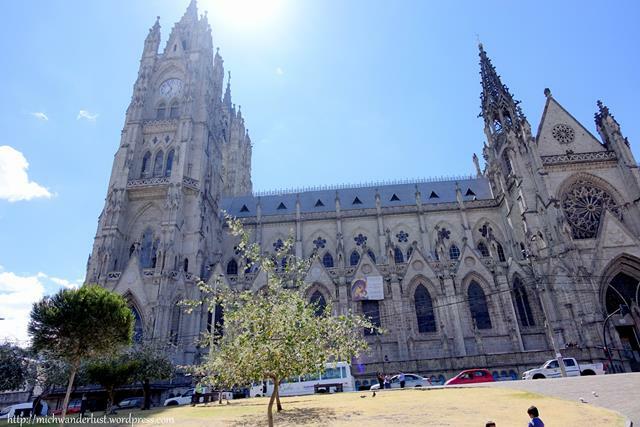 Next, we trekked uphill for about 5-10 minutes (at a very leisurely pace) to the Basilica (full name: Basilica del Voto Nacional). We passed through a number of very pretty colonial-era buildings. The Basilica itself is quite breathtaking. 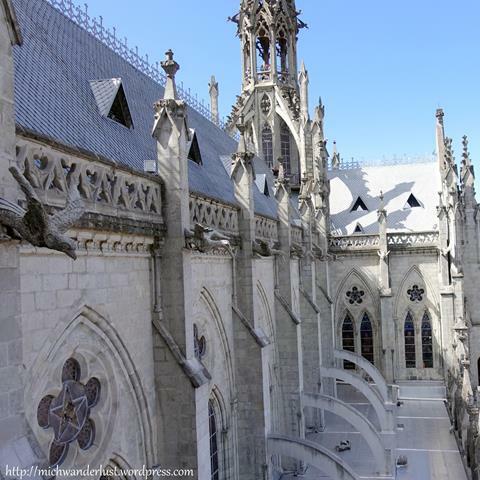 It was inspired by the cathedral of Notre Dame, and it shows, doesn’t it? Construction started in 1926 and it hasn’t really stopped – to this day they still keep tinkering with and rebuilding parts of it. Legend has it that if construction of the Basilica ends, so too will the world. 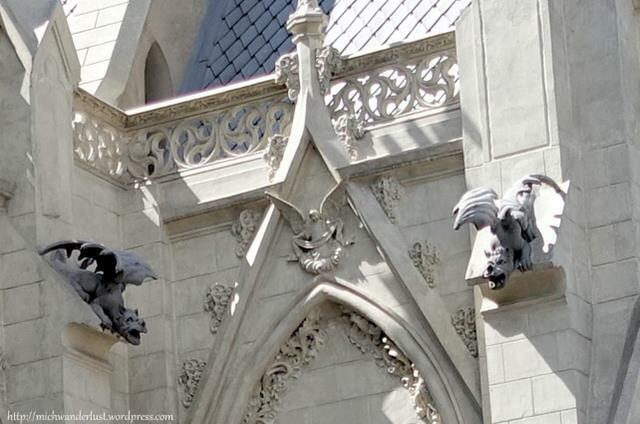 Similar to La Sagrada Familia in Spain! 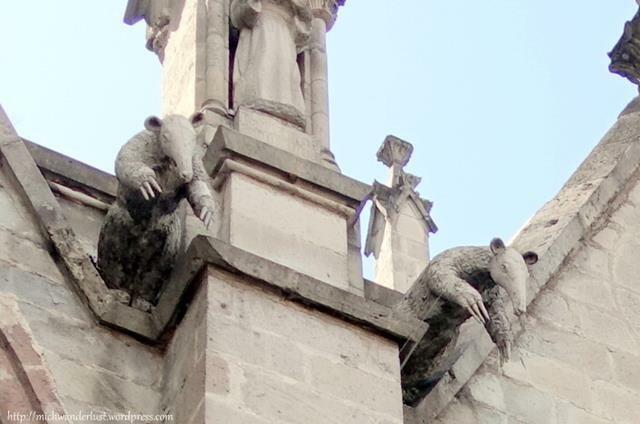 One of the major differences with Notre Dame is that instead of gargoyles that look like monsters, the Basilica’s gargoyles represent the fauna of the Galapagos Islands. 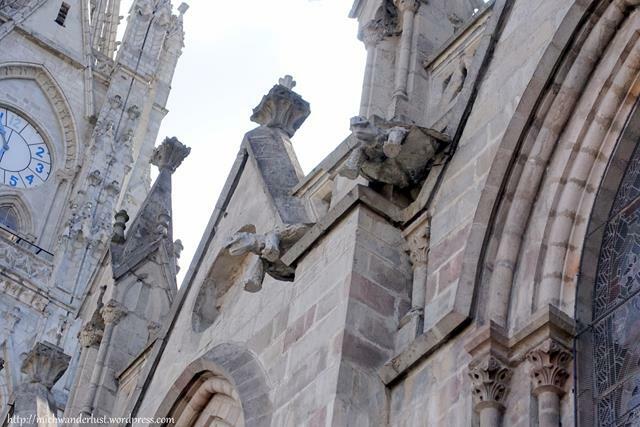 There is a section of the Basilica with more conventional Notre Dame-style gargoyles, though – you can see it easily because the walls are lighter than the rest of the Basilica. 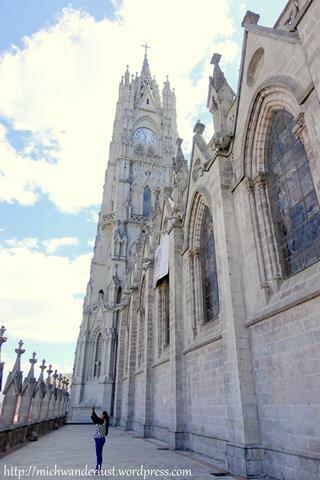 It’s well worth walking all around the Basilica to check out the different sides. 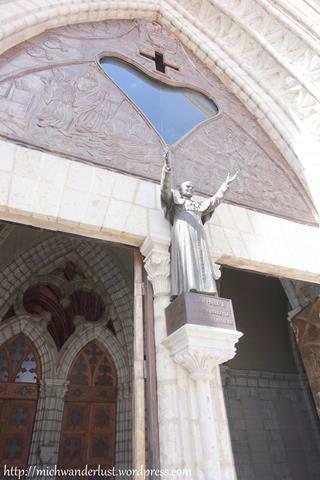 At the entrance below, you can see statues of various famous people in Quito’s history, including one of Pope John Paul II between the doors. He visited and blessed the Basilica (and the city) in 1985. 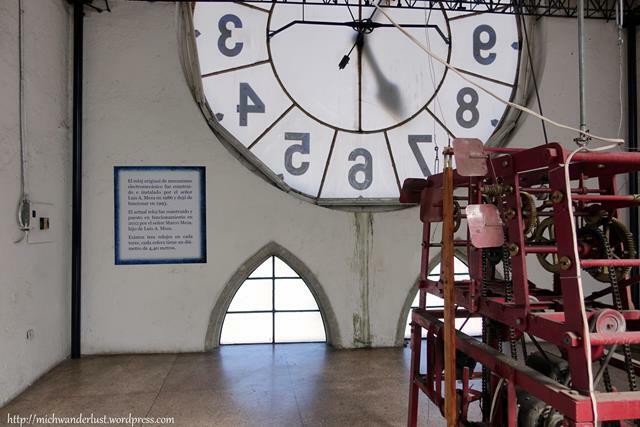 We climbed the two towers – the Condor Tower (the condor is a symbol of South America) and the Clock Tower (which is higher). 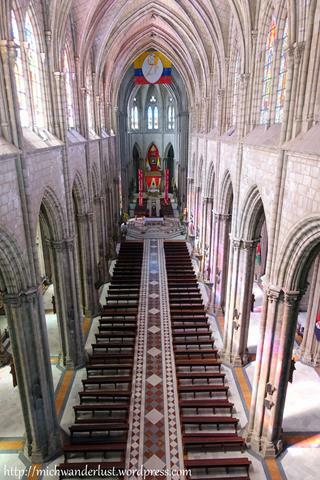 The entry ticket to the towers allows you a good view of the church from above. 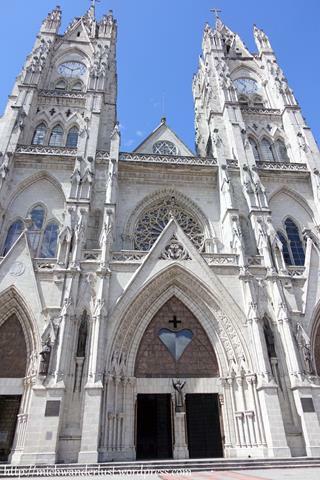 There are 26 chapels to the side, each one representing a province of Ecuador. 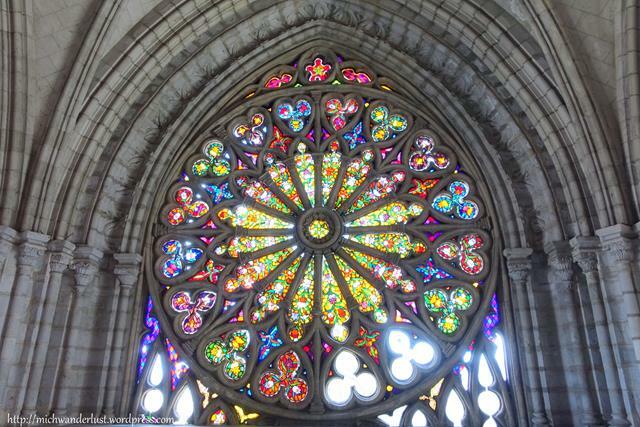 Fun fact: when it was originally built, there were only 24 provinces but 26 chapels. Did the builders somehow foresee that 2 more provinces would be added? 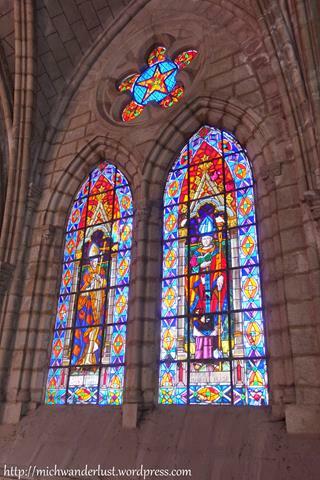 While the gargoyles represent the fauna of Ecuador, these stained glass windows represent its flora – primarily orchids. These are various bishops who are buried in the mausoleum underneath the Basilica along with other public figures like politicians. It’s not open to the public though. Climbing the towers is quite an adventure. I got quite breathless going up the stairs (altitude- or fitness-related, or both?) 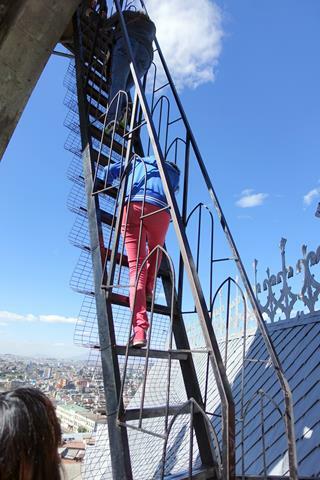 and you have to climb a ladder to get to the top of the Condor Tower. Don’t try this in heels! 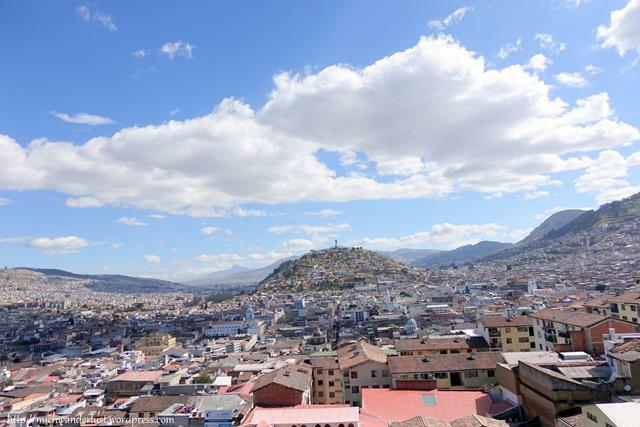 You are, however, rewarded with an amazing view of Quito. You can see El Panecillo – the hill with a huge statue of the Virgin Mary on top. It’s more accurately an Apocalyptic Virgin – with a crown of 12 stars, angelic wings and a chained dragon, based on the book of Revelations in the Bible. 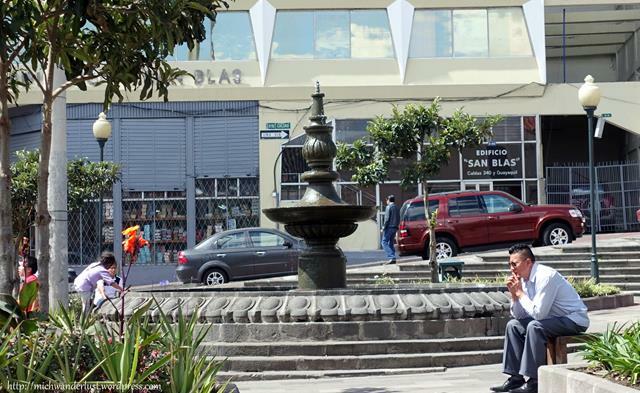 My teacher-guide said that the hill used to be an Incan temple and the Spanish conquerors destroyed the temple (along with all other Incan temples in Quito) and put the statue there to make clear that it’s a Catholic city. 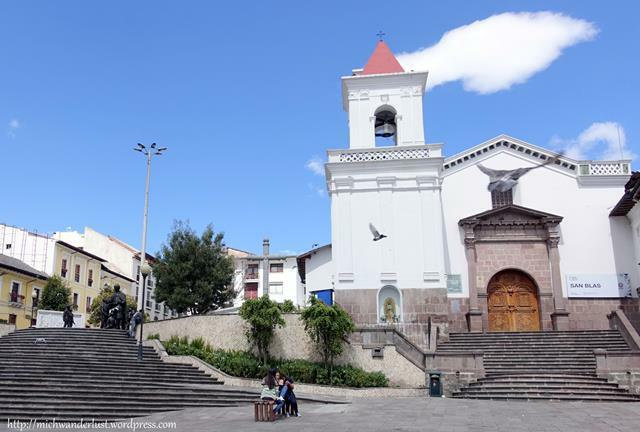 Today, most of the churches in Quito are built on the remains of Incan temples. 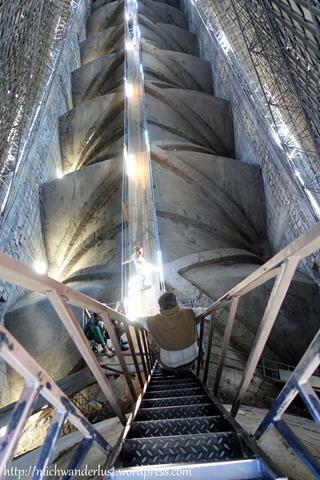 The Clock Tower is higher than the Condor Tower but the ascent isn’t so precarious. 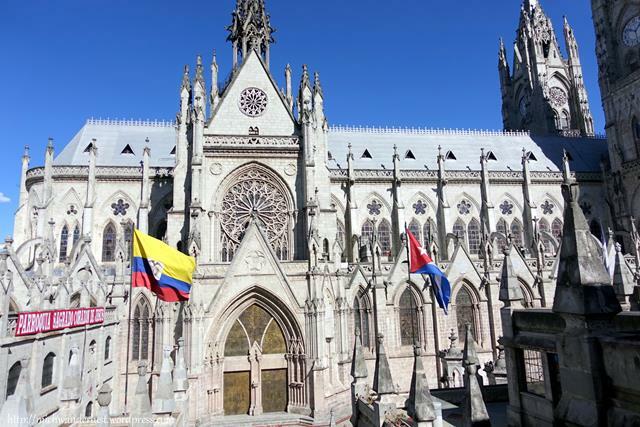 The flags of South American countries are lined up along one side of the basilica. I’ll cover the rest of the walking tour in my next post because this is way too long already! 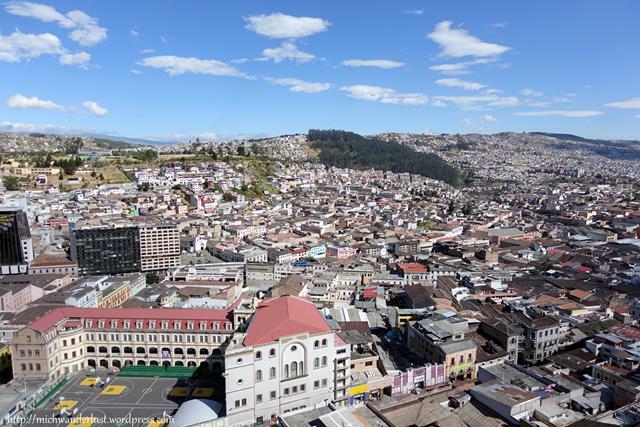 Have you ever been to Quito? Any recommendations for things to see or do? 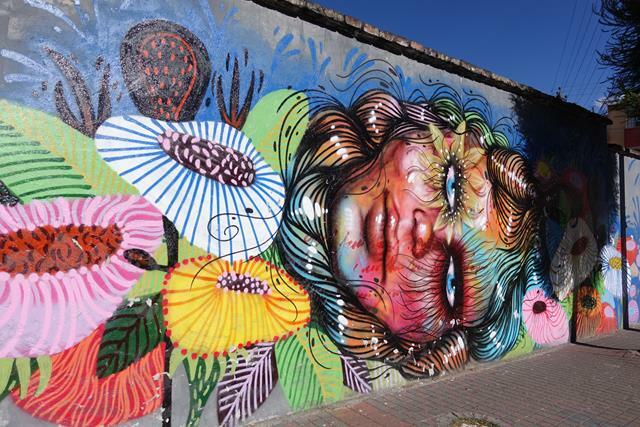 David and i love South America and Quito is the next place on our list. I am going to follow every one of your posts with interest. That’s great to hear, Lyn! I’m really enjoying Quito so far and hope you have a great time here too 🙂 Hopefully you find something useful here!